Club de Campo del Mediterraneo is varied game course indeed entertaining, but not very demanding.Nonetheless you shouldn’t underestimate this course, after all Sergio Garcia made his first attempts of golf here. Take the AP-7 motorway. Take the Castellon Norte (north) exit, towards Castellon. The road for reaching the club is 700 m, on the right. By the CV-10, take North Borriol exit (exit 28) direction to la Comma. 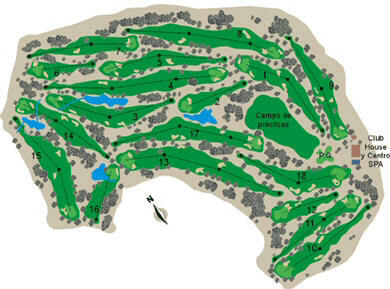 Characteristic of this region at Club de Campo del Mediterráneo are the olive groves, stone pines and carobs, which on this golf course also can numerously be found. The varied game course is indeed entertaining, but not very demanding. Nonetheless you shouldn’t underestimate this course, after all Sergio Garcia made his first attempts of golf here. 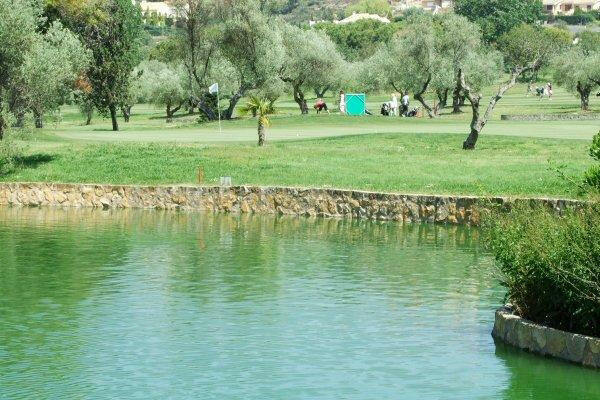 You leave behind the fantastic view over Castellon and the Med as you drop behind the hills and into a green valley, wherein lies the golf. And what an oasis ! Peacocks, swans, red squirrels, palm trees, artificial water hazards, excellent greens and good quality fairways all await. The course is quite compact, relatively flat on the front-9 and slightly more undulating on the back. Overall quality is good, ensuring this remains one of Spain’s hidden gems. Leave A7 at Castellon-Nord and join N340 direction Castello. After 1 km turn R. opposite Scania Trucks. Follow direction Campo de Golf Mediterraneo (and the many golfers !) up the hill for 3.7 km. Golf is on your Left. 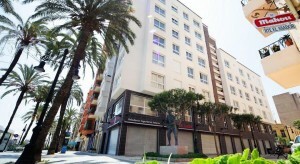 TURISMO CASTELLON MEDITERRANEO: GOLF, RESORT.